Markers of foamy virus infections in monkeys, apes, and accidentally infected humans:: appropriate testing fails to confirm suspected foamy virus prevalence in humans. Absence of serological evidence for foamy virus infection in patients with amyotrophic lateral sclerosis. 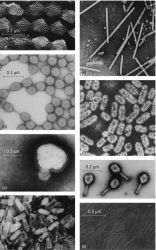 Multiple retroviral infection by HTLV type 1, 2, 3 and simian foamy virus in a family of Pygmies from Cameroon. Simian foamy virus transmission from apes to humans, rural Cameroon. Frequent simian foamy virus infection in persons occupationally exposed to nonhuman primates. Expanded tissue targets for foamy virus replication with simian immunodeficiency virus-induced immunosuppression. Simian foamy virus (SFV) has received increasing attention as recent findings suggest that human contact with Asian macaques in a number of contexts leads to infection with this virus (2,4). Of the 1,164 samples tested by WB assay based on chimpanzee foamy virus antigens, 21 (1. Interspecies transmission of simian foamy virus from chimpanzees and gorillas to Bantus and Pygmy hunters in southern Cameroon [abstract]. Macaques harbor several enzootic retroviruses, including simian foamy virus (SFV), simian type D retrovirus (SRV), and simian T-cell lymphotropic virus (STLV). We describe the first reported transmission to a human of simian foamy virus (SFV) from a free-ranging population of nonhuman primates in Asia. Care for captive nonhuman primates has lead to the transmission of a range of infections, including simian foamy virus (6), herpesvirus B (HBV) (7), primate malaria (8), and tuberculosis (9).